Read on for all the latest from RSVP! This page publishes announcements from the Society, including news about the conference, Victorian Periodicals Review, and our various awards and prizes. If you have something you’d like us to announce, then let us know via Facebook or Twitter. Nineteenth-Century Synergies: Ventures at Home and (Ad)Ventures Abroad hosted by the Department of English, at Presidency University, Kolkata, West Bengal, India took place on the 22nd and 23rd of February, 2018. Here they are next to a rather impressive poster advertising the conference! 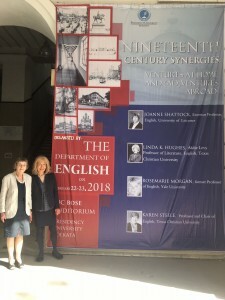 Professors Joanne Shattock and Linda Hughes, gave papers entitled “Journalism and Literature: Contested Professions” and “Tennyson, The Princess, and Tennyson’s Global Women Readers” respectively. More about the conference can be found here.